It had been a very long day. Jesus and his disciples had been out teaching about God and performing miracles. Many people followed them and Jesus spent the rest of the day teaching and feeding five thousand people. When the day was over and the crowds were leaving, Jesus told the disciples to go find their boat and go back to the other side of the lake. When everyone left Jesus went up to the mountainside by himself to pray. You see, Jesus needs to pray too. He had a long tiring day and performing miracles was very tiring. He knew He had to be close to His heavenly Father so He could have the strength to go on each day and resist all temptation that came His way. When Jesus had finished praying, it was very early in the morning (probably around 3:00 or 4:00 am). He came to the shore where the disciples had left sometime earlier. He could see the boat but it was quite far away, the wind had taken them faster across the lake than usual. Jesus knew that He had to get to the other side of the lake and join the disciples. I'm sure He could've swam, flew, or jumped across the lake - this is Jesus we're talking about, He could've done anything He wanted. 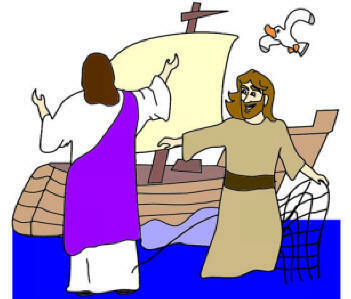 But He decided that He could teach the disciples something so He started to walk on the water towards their boat. I'm not sure if you've ever tried walking on water, but its impossible. Keep in mind the water was very deep, and I bet some of the fish even noticed Jesus and stopped to watch the miracle. So Jesus walked and walked and finally was close enough to the disciples that He could see each of them on the boat. All of a sudden one the disciples said, "What is that!" He pointed out into the water and all the disciples turned around to see what was out there. "I think its a ghost, what else could it be!" A few of the disciples said terrified. They had all come to one side of the boat to see the strange thing on the lake and the boat suddenly got tipsy and some of the disciples fell back into the boat to steady it and keep it from completely tipping over. Jesus could see and hear the confusion, he shook His head and called out, "It's alright. I am here, do not be afraid." The disciples looked at each other and felt silly they had thought that their Teacher was a ghost. Then Peter replied, "Lord if it's really you, tell me to come to you on the water." "Come." Jesus said with His hand reaching out to him. The disciples watched as Peter carefully got out of the boat and began to walk on water towards Jesus. Peter watched Jesus at first, but then started noticing the wind and the small waves on the water and looked around with worry. As soon as Peter started to be scared he started to sink, and he cried out, "Lord, save me!" Immediately Jesus reached out his hand and caught him before he was totally covered with water. "You have such little trust for me Peter," Jesus said. "Why did you doubt me?" Peter walked to the boat with Jesus by His side and wondered to himself why he got so afraid. He knew that Jesus could do anything, it seemed that as soon as he took his eyes off Jesus he started to think about other things and that is when he began to sink. As soon as Jesus got into the boat the wind stopped and the water was calm. Then everyone in the boat worshipped Jesus saying, "Truly you are God's Son!" When they had crossed the lake to the other side people began to recognize Jesus again. The people from that area told their friends, and they told their friends and soon people were coming from all over to see Jesus. They brought all the sick people to him and begged to touch the corner of his long coat because all who touched him were healed.